I can't seem to figure out why Pinterest Analytics shows so many more clicks & visits to my website than my Google Analytics. Here's an example from the dates of 5/24/2017 to 6/6/2017. You can see that on one day it shows over 800 visits. But now look at my Google Analytics for the same date range. And you see that on that same peak visit day, I didn't break 200. I researched this and couldn't find any definitive answers. There was some speculation here on a Google forum. 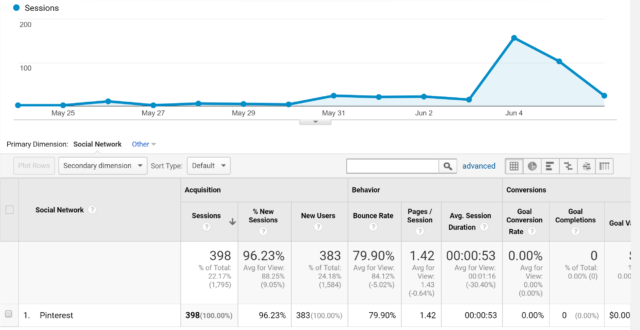 It's normal to see more clicks than other analytics tools because we're tracking clicks, not visits. It’s also possible for a person to go to your site and leave before your website analytics tracking code can record the visit. Check with your analytics provider if you see any discrepancies. So I still have no answer to this question. I think I'm going to purchase a different Analytics tracking software to run simultaneously with Google Analytics so that I can compare stats. If Google Analytics remains my benchmark than it's hard to know whether Pinterest or Google is causing the discrepancy. I'm just not sure which analytic software to use. I'll do some research later.